Last weekend, Christopher's Cub Scout troop had a campout in the park, Arbuckle Park. But he got sick, and couldn't make it. I had even been excited about camping at the park, and had volunteered to bring some supplies. But I ended up having to take the supplies over, and not staying, and not being able to play. I like the Scout Moms, and I had been looking forward to it. Santa had brought us a new family tent, and we'd really been excited about using it. But not with sick sweetboys. Sam had thrown up Wednesday, and I didn't think much of it, because he gets pukey when he doesn't eat. But perhaps the not eating was caused by the feeling bad, because by Friday night, Chris and Jake got sick. It made last weekend rough. It was good to have a three day weekend be a lot more relaxing! This - this was a relaxing moment. I had Eric take my picture so I could remember. But this weekend, Friday afternoon, Daddy went out to mow the lawn, and after which surprised us with putting up the new tent while we watched a bedtime show. The boys slept outside Friday night. Then Saturday night we put up a fire, and sat outside for a late evening, some smore's and grilled out dinner. We circled chairs around the fire, bombed the yard with oily bug spray, and just chilled out. 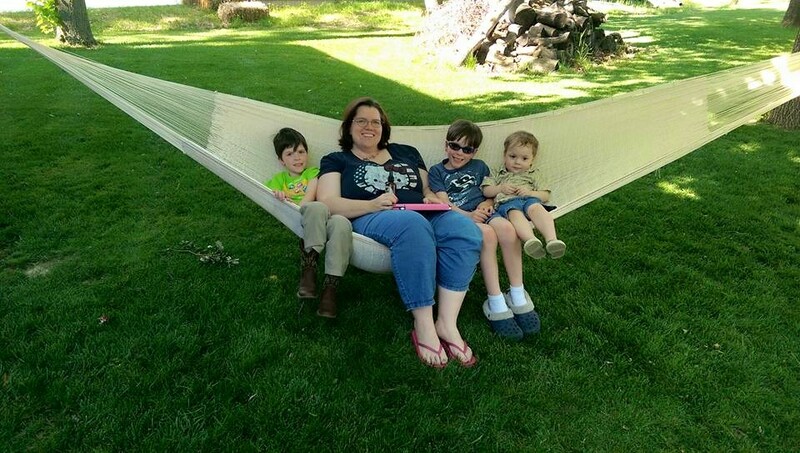 The boys got a huge kick out of me putting up my hammock too. Our backyard looks pretty groovy with the new tent put up. I love our shady trees. Can you tell there are three sweetboys sausaged in there? Princess likes to guard the fire. And sometimes she'll chase or bite at the blowing sparks. She looks so serious. But I know this dog, and it's very hard to take her seriously. A happy place - roasting marshmallows. So since it's the 21st Century, Eric and I were potching on Facebook while we were all outside by the fire, and I put out an APB that folks would be welcome to come over for Smores or campout in the backyard. We had one family of takers. 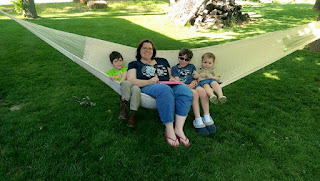 My friend E and her boys came over, both her boys are in the same grades as Chris and Sam, though they don't go to the same school. So they played in the backyard for a while, trying to put the soccor goals together, and play soccer. But by the time they got the goals up, my boys were Over It. They aren't really soccer playing kinds of kids. Still, there was running, and playing. And it was relaxing, and felt almost like an introduction to summer. By the time it got dark, and their friends headed out, they were Toast. They went to bed easily and slept outside all night! Oh yeah, we'll be doing this again!